Flea season means stress and itchy discomfort for you and your pets. Flea populations multiply rapidly, and a small infestation can quickly turn into a nightmare if left untreated. There is no single chemical or natural method of flea control that will get rid of fleas forever. However, with regular cleaning, bathing and combing, you can rid your home of fleas without using harmful chemicals and prevent major infestations from occurring in the future. Bathe your pet regularly in lukewarm water. Use a standard pet shampoo to drown and kill fleas. Do not use pesticide shampoos or flea dips. Comb your pet with a flea comb frequently to remove fleas. Drop any fleas that come off onto the comb in warm, soapy water. Drop a whole, sliced lemon into a pot of hot water. Leave it to steep overnight and then strain out the pulp. Sponge the lemon rinse onto your pet’s skin after bathing and allow it to dry. This helps to sooth irritated bites and repel fleas. Vacuum your home several times a week. 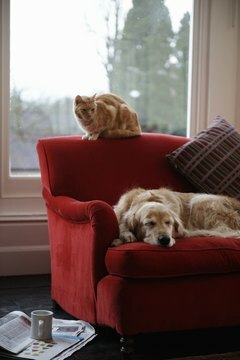 Pay special attention to crevices, under furniture, carpeted areas and places your pets sleep. Throw vacuum bags away in a garbage can outside about once each week. Vacuuming alone can remove a significant amount of eggs and nymphs, which make up the majority of your infestation. Pay special attention to dark, damp places when cleaning. Fleas typically lay their eggs here where they won’t be disturbed. Wash your pet’s bedding in hot water at least once each week and place in the dryer to dry. Place the bedding in large sealed bags to transport it to the washing machine to avoid spreading any flea eggs and larvae that may be in it. Sprinkle diatomaceous earth as directed on the label on floors, carpets, bedding and dogs. Do not spread diatomaceous earth on cats. Diatomaceous earth is a natural material that is effective against adult fleas. It is a dust made up of tiny fossils with sharp, jagged edges that cut and dry out the fleas. Place a pan of warm, soapy water in the middle of a room your pet sleeps in. Leave the pan in the room overnight. The warmth will attract fleas that will hop inside. Monitor your flea removal efforts by tracking the number of fleas you find in the morning. Keep outside vegetation trimmed short in areas where your pet spends time. This increases sunlight and dryness, which fleas avoid. Avoid inhaling diatomaceous earth and do not apply it near your pet’s face. In large amounts it can irritate the windpipe and lungs. Use essential oils or natural products containing clove, citrus, cinnamon, d-limonene, tea tree, geranium, lavender, linalool, eucalyptus, bay and rue oils sparingly. These have been known to cause severe reactions in some pets. Avoid the use of any product that contains pennyroyal oil. This oil can cause seizures, coma and death. Safer products are those containing peppermint, cedarwood, rosemary, lemongrass and thyme.